“But there is no extravagance of beauty and love.” – Imelda Marcos at 80, quoted in the Associated Press (AP) coverage of her bash. I wasn’t invited to that party. But in early March, 2008 I got a one-on-one with Mrs. Marcos in a condominium unit crammed with photos, clippings and paintings of a past she believes was the Philippines’ golden age. It was a sudden summons after weeks of chasing her for an interview. The result was a two-part series on “Imelda’s Truth” — photos by one very harried writer-editor. There is no denying the Imeldific charm. It reels one in, however fierce the psyche’s resistance. So maybe I didn’t push her enough. I don’t know… but here’s the original two part series — divided into three now — where we wisely (I still think) let her ramble on rather than filter her thoughts. Only Imelda Marcos of the fabled gems and gowns and shoes can don huge garish costume jewelry and have thousands of women stampeding to buy these. Forget irony. That is lost on the former First Lady. This is the woman, after all, who’s upended every theory there is on crime and punishment. 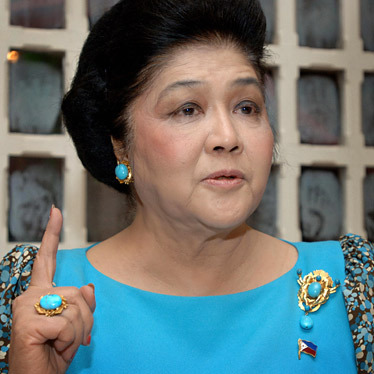 At one point facing some 900 cases for graft — for money salting and everything and anything connected with the financial rewards of two decades of strongman rule — Mrs. Marcos has won acquittal after acquittal and, in several instances, forced the Philippine state into accepting compromise deals worth a fraction of what was being sought. And don’t even dream of waking one day and seeing a repentant Imelda on television. She doesn’t believe there is anything to apologize for. She and her beloved Ferdinand are the victims. EDSA I marked the death of Philippine democracy. Martial law brought back human rights. The late President Marcos not only was a true democrat; in dispatching his wife to charm Mao Tse Tung, he also single-handedly ended the Cold War. For the latter, she says, the Marcos clan paid a high price. A jealous superpower kidnapped them at the height of the 1986 EDSA People Power revolt and dumped them in Hawaii, leaving them high and dry and, yes, penniless. But natural law — a favorite mantra of Mr. Marcos — says life is a circle. With cosmic rays blessing the mythic couple, enemies were bound to get their comeuppance, says the Gospel of Imelda. Mrs. Marcos won a big case on her birthday. And over lunch, she points out that the World Trade Center twin towers were bombed on Mr. Marcos’ birthday. There is no coincidence in life, says his widow. There is plenty of the surreal in Philippines where, Imelda says, openings in the sky drizzle down rays that make for great rock and roll. All the country’s a stage. Imelda’s advice for people waging revolutions, peaceful or otherwise: Forget it, folks. Do not even try to jolt Filipinos out of their perpetual fiesta mode. The only thing that will get them going is a love-fest. Though when they do get going, like during EDSA I, it’s because they don’t understand. So, Joseph Estrada croons and unleashes one-liners as he walks away from conviction for plunder. And Imelda; well, Imelda was, is, and forever will be Imeldific. Why fight it? she says with a sniff,. After all, ordinary folk from Tondo to Ilocos grow faint with ecstasy whenever she opens her arms and tells them to come home to mama. Mama promises to share the joy represented by rooms full of gold and stock certificates, if and when those evil people tire of chasing after her beloved Ferdinand’s hard-earned wealth. One of those ill-gotten wealth hunters had sent an emissary to Imelda, asking for P10 million to give up the chase, so he could spend the rest of life doing bad imitations of Elvis Presley. Imelda’s flat is a kleptomaniac’s paradise. Every inch of wall and mantel space are crowded with sentimental objects d’art — the kitsch and the classic in a madcap tumble. There is so much for the eyes to follow that they fail to register that the cream walls and ceilings are beginning to turn gray. Everywhere there is gilt. It’s apt for the widow of a man who ostensibly made his fortune in gold trading, to paint even lahar-made picture frames with gold leaf. 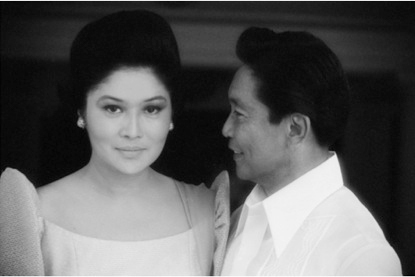 The public image of Mrs. Marcos is that of an imperious dowager; studied in her manners though capable of breaking out now and then into vastly entertaining theatrics. Up close and personal and in the comfort of her sprawling Makati flat — Mrs. Marcos shows more of the abondanza that her public forays hint at. Who cares about brawn and intellect? The war, according to the gospel of Imelda, is won by willpower. And chutzpah, we might add. There is nothing more surreal than seeing Imelda walk into the lobby of the Cultural Center of the Philippines and have scores of other bejeweled woman — including some who screamed and cried on EDSA — fawning over her. At home, there is little of the young, insecure beauty queen and much of the woman who learned early on to make capital of her beautiful bones, doe eyes and creamy skin. Mrs. Marcos says she is both yin and yang. There is plenty of masculinity here. She is in a navy blue pants suit with turquoise and aqua sleeves. Huge turquoise earrings are clipped on the ears. Hands now running to pudgy sport a matching ring. On her chest is a mammoth brooch with twin figures holding up spheres; very Malakas and Maganda. Imelda sits legs akimbo, sometimes drumming both feet and even crossing limbs in the masculine de quatro. Her talk is earthy; her lectures and analogies full of phallic symbols. She is at turns arch and indignant — all wounded pride and smug confidence. At times, she is much like one of the boys. And when she turns on that charm, oh boy. With the assurance of great beauty, this 79-year-old survivor relishes re-enacting the coy approaches, the damsel-in-distress poses that disarmed strongmen from Asia to the Middle East. She stands and leans over; a hand reaches out to caress as she recalls her blithe handling of a love-sick, macho spouse who ruefully warned of emasculation as he begged her to lose some of their arguments. You may have fought against the Marcos dictatorship, maybe sacrificed loved ones in that fight; there is simply no escaping the Imeldific charm. She confesses to being greedy, and needy and extravagant. Hell, you can call her vulgar and she’ll just give that sideways smile — vulgaris, she reminds you, means one’s cup overfloweth with beauty.